If you ride long enough you are going to get caught in rain at some point, no matter how meticulously you plan your ride. And we all know, no one likes to get wet and cold and then have to continue riding on. The right waterproof rain gear can make all the difference between a spoiled ride and an unforgettable adventure. Being riders for decades, we at WICKED STOCK understand the importance of right rain gear and have all your wet weather needs covered. 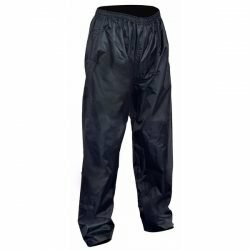 We manufacture a wide variety of one piece and two-piece rain suits, rain jackets, rain pants, Hi-Viz rain gear and waterproof gloves. All of our rain gear is constructed from 100% waterproof textiles. Many of our Textile Motorcycle Pants have waterproof and breathable rain liners to keep you dry and warm for as long as you ride. Even 100% waterproof garments are susceptible to water entry at seams due to stitching. We make sure all the seams of our rain gear are sealed and tested to ensure 100% waterproofing. We use Durable Water Repellant (DWR) coated fabrics to make all our rain gear. This DWR coating prevents water from building up on the exterior of garment and beads the water so it can be shed from the garment easily. Uncovered zippers are prone to water entry as rain water hits with force due to riding speed. Our designers take special care to ensure none of the zippers are left uncovered. All our rain suits and jackets have double storm flaps at entry, secured with ultra-strong Velcro closure. 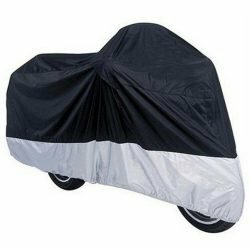 All our rain apparel is designed to fit over your regular motorcycle clothing so that you can don the rain gear quickly when rain hits. Make sure you take measurements with your normal riding gear on. Visibility becomes a major concern when riding in the rain. All our rain apparel is designed to provide maximum reflectivity and visibility. We use extensive reflective striping on all of our rain suits, rain jackets and rain pants.